When I was in the Navy, I carried the M9 constantly. I qualified Expert with it several times, got really proficient with it, and after discharge I finally settled on version this pistol as a personal firearm. The one gripe I had with it was the lack of steel parts and over use (in my opinion) of plastic and MIM. 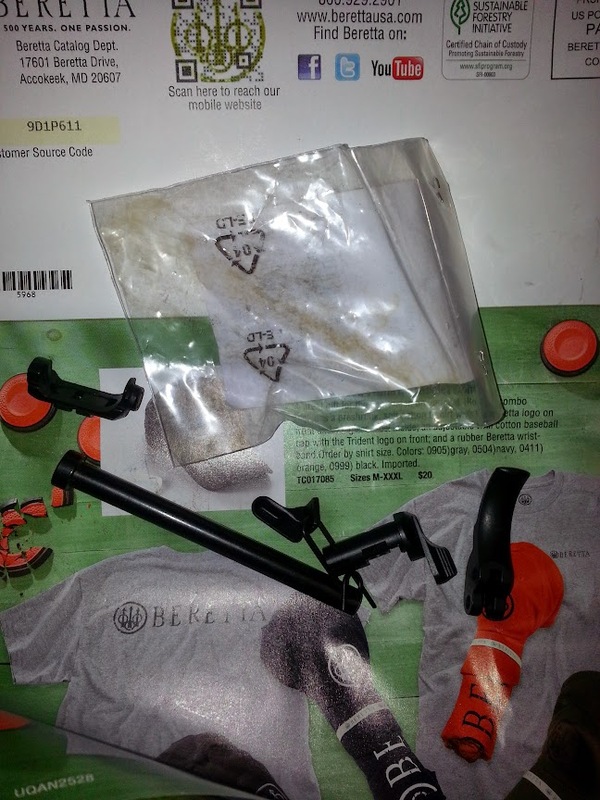 The first chance I had, I purchased the steel parts kit from Beretta and got to swapping things out. Now here is the kit. The packaging was a lot to be desired. The parts were just tossed into the box and the plastic bag that you would think should contain the parts was empty. The parts were just bouncing around. Kit as it was just shoved in a box. 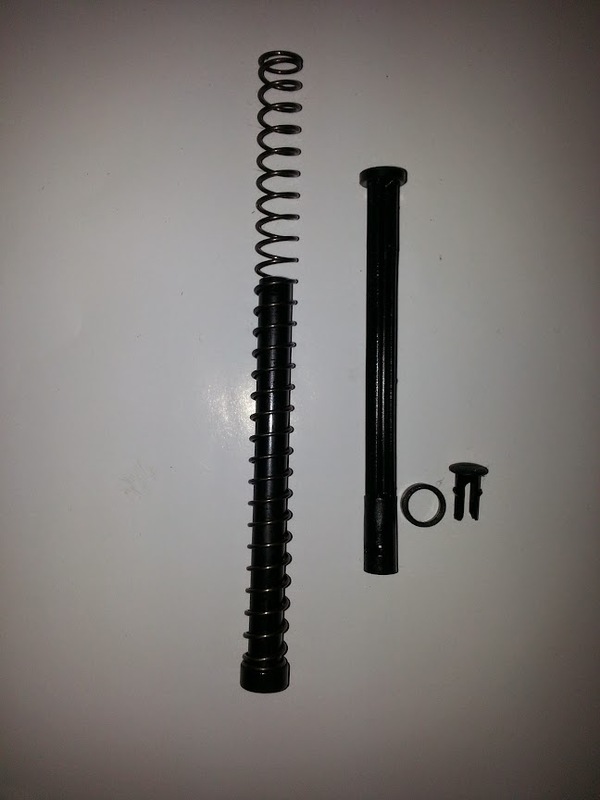 The recoil guide rod from the factory is actually a piece of plastic that holds the compressed spring. The new one is actually like the M9 I carried in the military. It is nice, sturdy and steel. It is kind of tough to get the plastic one apart to get to the spring. 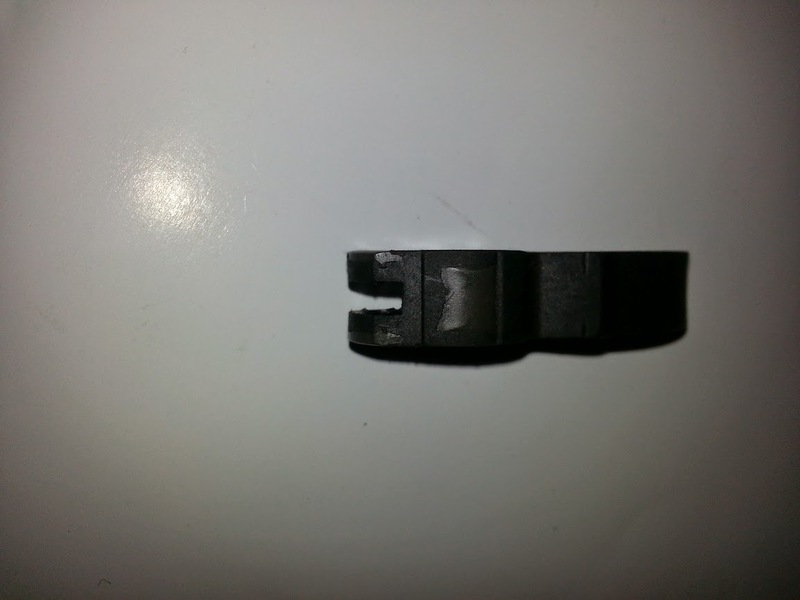 There are little tabs that hold the end of the plastic together that need to be pried off with a regular screwdriver. Once that is done, the rod just slips into the spring and you insert it spring first into the slide. The rod slips into place as before. Below are the parts. You can see the way that the plastic rod has the end attached. Putting the trigger in is a bit odd. 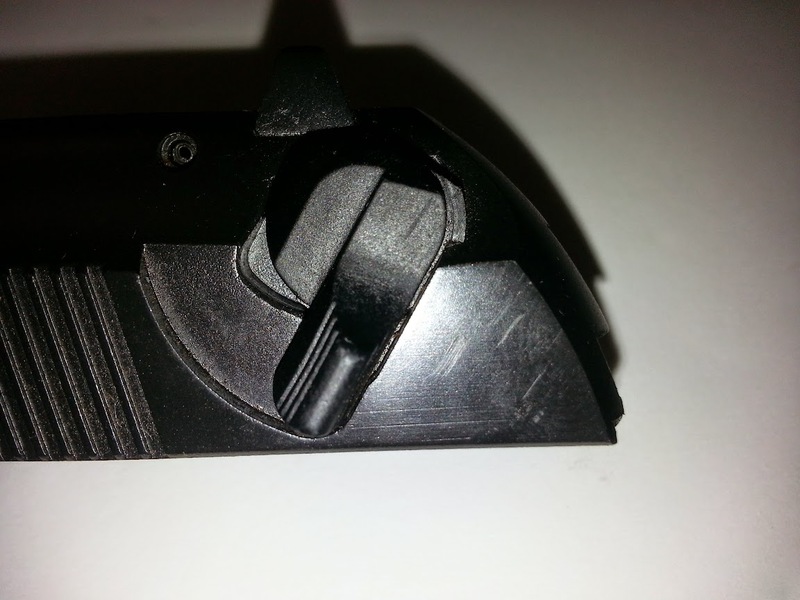 The old trigger has an actual spot for the spring to rest where the spring must be moved and rested on the rod that goes through the top of the trigger. Here are a couple pictures. 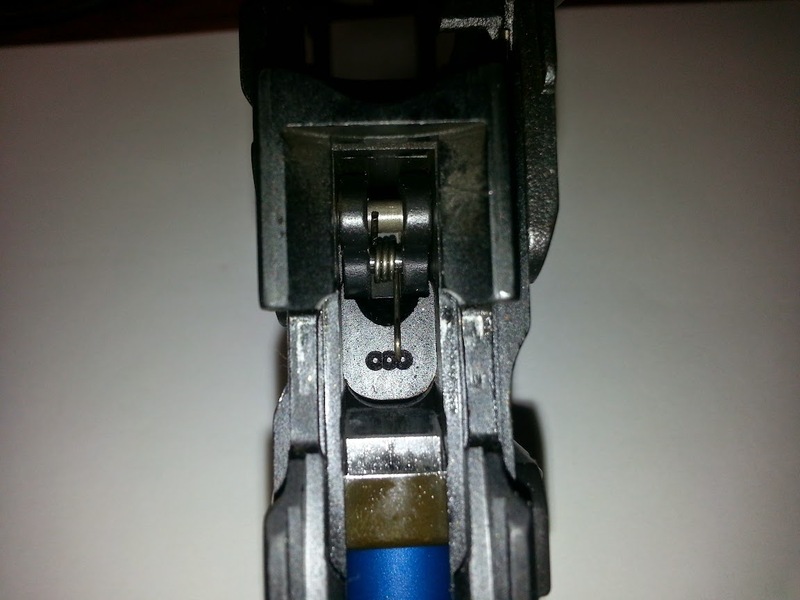 This first one shows how there is an actual spot for the trigger spring on the old trigger. 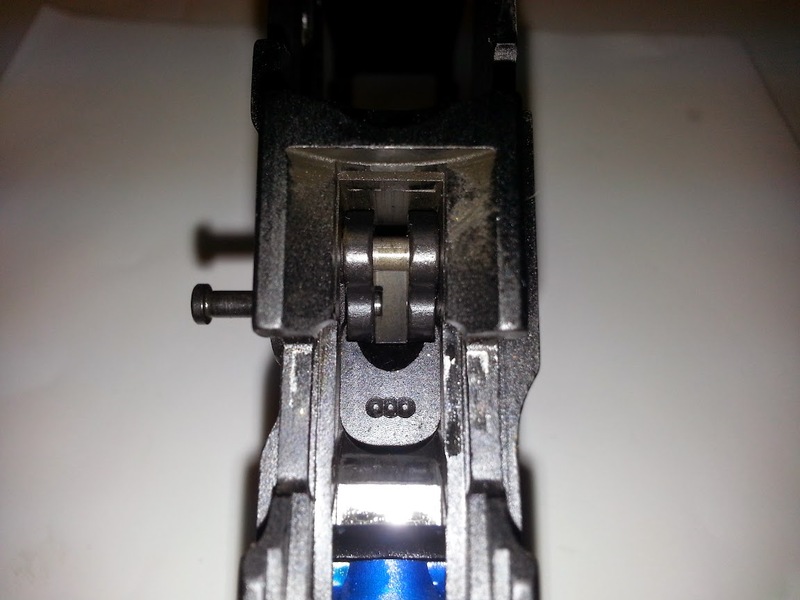 This is how the trigger assembly looks with the springs removed. Once you get the spring installed and it all put together, it should look like this. 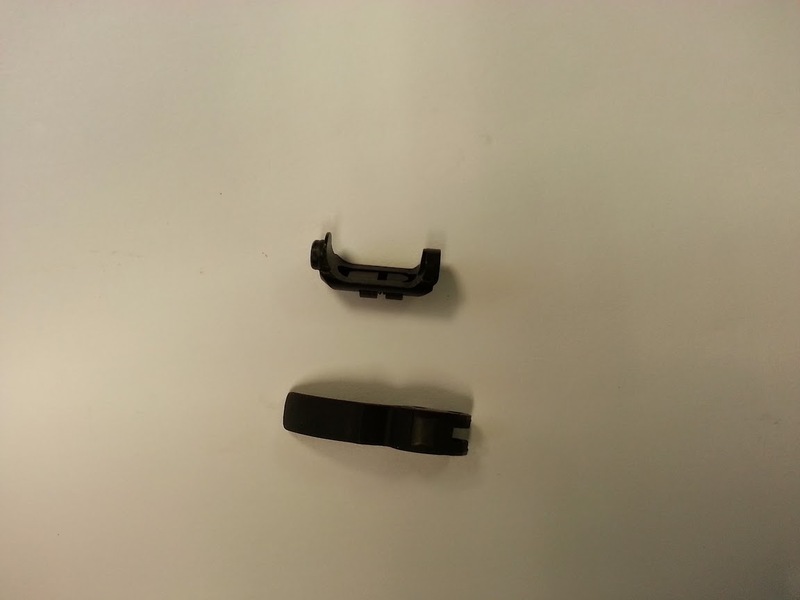 There are several companies that make after market trigger springs that make this a lot easier. I think I am going to do some research and pick on up eventually. If I do, I will post up the information here. 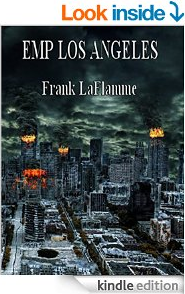 The next pain is the installation of the magazine release. There IS a trick to it. Check out this video to see how it works. Once you figure out to put in the correct side first, the rest is easy. Next comes the REALLY tough part. I have to swap out the decocking mechanism. This is a bit on the rough to do side. As you can see, this is definitely MIM. To perform this upgrade I did a Youtube search and found a video about installing a Wilson low profile safety lever. It gave me the information I needed to be able to do this install. I did have to go find really small punches, however. Thankfully there is a Harbor Freight down the road. Now I only have a few more modifications to make this the way I want it. I will be getting a skeletonized trigger, VZ G10 grips, and a couple Wilson Combat springs to finalize this build. This last video is a complete (except for the safety lever) upgrade of the Beretta parts. I used this initially, but found that the guy doing the work was almost too good at putting the parts in. He made it look way too easy. It really was much more difficult than he made it seem. I really love the feel and function of the Beretta 92/96 frame pistols. Many people tend to hate on them for whatever reason. Considering the abuse I put mine through while Active Duty and then still qualified Expert with it at the range on a consistent basis, I feel that these are great systems. This entry was posted in DIY Projects, Firearms and tagged Beretta custom, Beretta customization, Beretta pistol, Beretta upgrades, customized Beretta, DIY pistol upgrades, steel parts kit on February 27, 2015 by Woodsbum. I got into a discussion the other day about natural cordage and 2 strand twists. Now, I am not the best person at natural cordage because I tend to over stress the material and break it. This has led me to practicing with man made cordage. At the end of this post are three videos. Two are about making cordage out of natural materials and one shows how to do the 2 strand twist with man made materials to get the technique down. In my area, nettles are very common and easy to harvest. Cordage material is in no short supply here, which is lucky for me considering how much I break. Lots of material really are necessary to practice with to become even slightly proficient. To effectively find cordage materials, just go out and see what is available in your area. Most plant materials that pulls apart into long strands of fiber can usually be twisted and made into a cordage of some sort. The last video gives you a look at how to strip willow bark for use. Here is the practice video to show you how the whole 2 strand twist works and is done. This video shows how to use nettles to make cordage. Be sure you are careful when you strip the fibers off the plant. I tend to break them more often than not. Just practice and be careful. This last video shows you how to strip willow bark for cordage material. The techniques seen in this video should give you enough of a basic knowledge to go out and do some testing of different materials in your area. Just go out and have some fun! This entry was posted in Camp Techniques and tagged 2 strand twist, cordage, man made cordage, natural cordage, two strand twist on February 23, 2015 by Woodsbum. 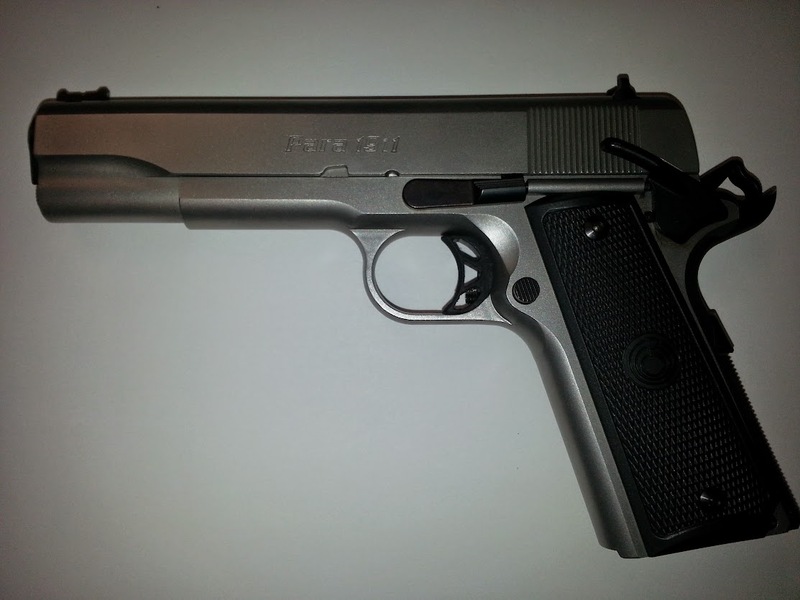 At this year’s Black Friday sale, I purchased a Para Ordnance Expert 1911 in stainless steel. The pistol feels nice and shoots quite well, but aesthetically it isn’t quite as “pimped” out as I would have liked. I guess I can’t complain too much considering the price I paid, but still I would prefer to have this pistol much more eye catching. To accomplish this I did a little shopping and decided to start my upgrading process with the grips. Most grips you find online are the same design just resold by a different vendor. Not much variation seems to exist considering I wanted something obnoxious with skulls. 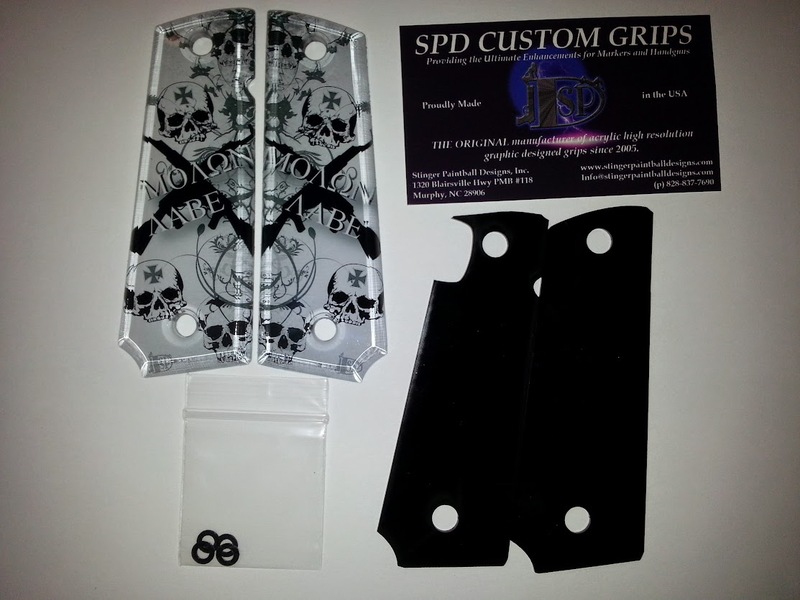 Then I stumbled across this SPD Custom Grips place out of North Carolina. It looks like most of their products are for paintball, but they did have some grips for real handguns that look pretty redneck pimp. This is what I ordered and for a reasonable price. Now swapping out grips on a 1911 is almost USAF proof. It is just two screws per side and then popping the grips off the bushings. It’s a very easy and simple process. When putting these grips on, the spacers are said to be required. Unfortunately the spacers don’t fit the grip lines exactly so there is an overhang on the edge of the grip. I will end up having to go buy a bushing tool and different bushings for low profile grips from Brownells or Midway to skip the spacers altogether. 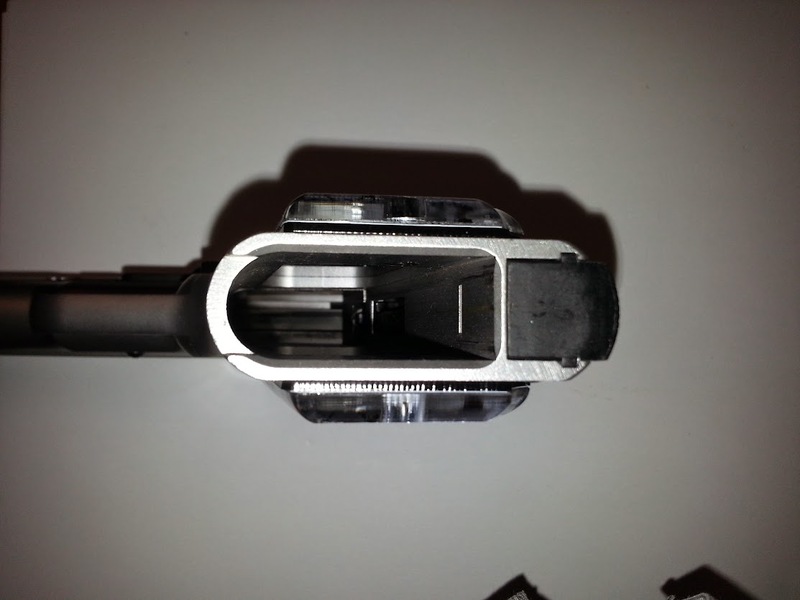 You can also see how thick this makes the handle of the pistol. This really isn’t that comfortable anymore so it will need to be fixed. The price for firearm fashion, I guess. I will order my bushing parts sooner than later, but after I get my .50 BMG out of layaway and pay for some ammo I committed to purchasing. Once I get the bushings taken care of, I will do another post about that in case anyone runs into this problem like I did. The overall appearance of the pistol after the grips is pleasing to me. The next upgrades I will do include swapping out all the black parts for stainless. This includes the main spring guide, beavertail, safety, slide release and mag release. I will leave the black trigger and hammer for accent, however. 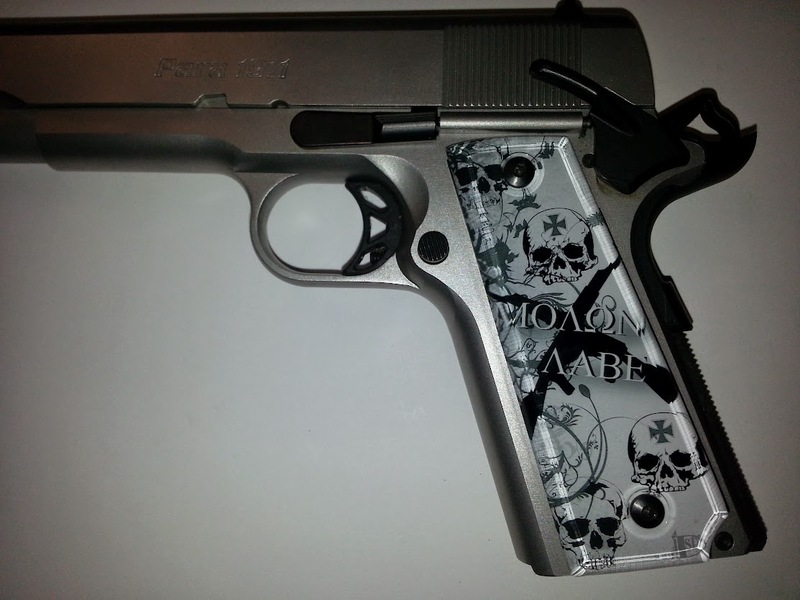 This entry was posted in Firearms and tagged 1911, 1911 modifications, 1911 mods, custom 1911 grips, custom grips, Para Ordnance on February 20, 2015 by Woodsbum. I have been waiting for what I considered “the perfect time” to post this video It is about log home building in Finland. Their use of hand tools is simply amazing. I can only dream of ever getting as good with an axe as these guys. Their ability to hack out HUGE chunks of wood with such precision makes this one of my favorite videos. Hopefully you find this video as fascinating and enjoyable as I do. This entry was posted in Miscellaneous and tagged Finnish log homes, log cabins, log homes on February 16, 2015 by Woodsbum.